Long-haul and semi-trucks appear quite frequently on roads and highways. Some run by with only their company’s name written on the back doors. Others will catch a double-take from everyone on the road as they zoom by. They’re covered in bold colors and eye-catching graphics emphasizing their business. It makes you remember what their company is all about as you continue driving. At SpeedPro Imaging Memphis East, our team makes custom fleet wraps that leave this exact impression on everyone. Whether you’re going all out with your design or covering only a portion of your vehicles, we have the tools and skills you need to make your brand more visible. If your trucking or van service company is based out of Memphis, Olive Branch or Collierville, contact us today to get started! Long-haul trucks already have an enormous presence while on the road. They’re large, they’re noisy and they’re intimidating to drive near in traffic. When you drive a truck, you might feel like you have some unnamed power. Think about how much more power you could have just by dressing up the exterior of your vehicle! Designing your full company fleet to look identical and bear the same brand while traveling helps your business gain visibility. At SpeedPro, we create all our vehicle fleet wraps with durable vinyl materials. Cast vinyl gives you a lengthy lifespan for the ultimate branding coverage. It prints thin, making it easy to roll onto the side panels of a truck and showing off our vivid, fade-resistant ink printing technology. Calendar vinyl is a more temporary option for vehicle wrapping with a shorter lifespan. If your truck has a lot of exposed bolts or you’re looking to wrap around the corners of your siding, calendar vinyl can do so with ease. Choosing between your coverage amounts may seem like a challenge, but our design team is here to assist! We’ll help you decide on a course of action during our consultation meeting based on the effect you’re looking to create and what the needs of your brand are. A full fleet wrap is exactly what it sounds like — the fullest amount of coverage. Here, you can cover the hood, side paneling and back door of your truck or van in one sheet design. With a partial fleet wrap, you can choose specific areas to cover, such as only the side paneling or just the back door and front hood. Companies that are just starting out or looking to grow their business exponentially will want a full fleet wrap, while those who want a little side promotion might opt for a partial fleet wrap instead. 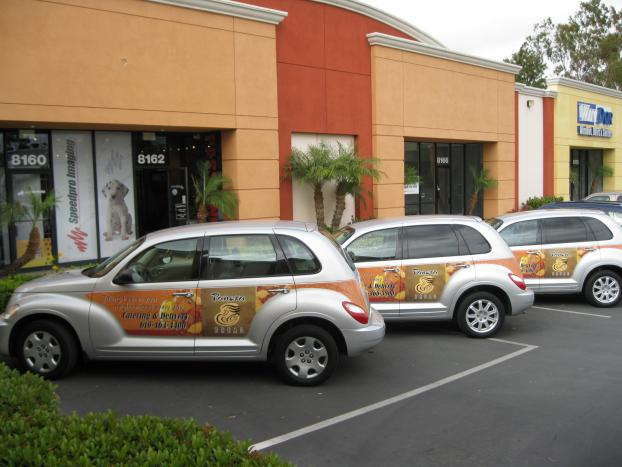 Vehicle fleet wraps are the perfect option for growing your business at a fast pace with the most visibility. If you’re looking to show off your brand, call us today, and we’ll schedule a consultation to begin discussing! Great customer service, quick turn around, and quality products . Always wonderful working with the team at Speedpro. They are quick to fill my requests and I am always thrilled with the end product! A true gem of a business in the Germantown area!! I like that you make my order feel just as important as someone with a giant order. You are always professional, easy to work with, and speedy. Thank you!